Brad’s Cactus Shack is quite possibly the largest collection of Brad-related material you could ever hope to find. Don’t trust any other websites on the internet for your Brad fix. Everything you need is here. Click on the menu options above for things, or just start reading and listening below. Here’s another episode where I activate old man story mode and tell you a thing or two about how the 1980’s were. Part One involves a machine called an Echoplex, which I used for all kinds of fun and shenanigans as a kid. The Echoplex segment isn’t quite as exciting as I’d hoped it would be, but it’s still fun to play around with an old machine and listen to the things it can do. 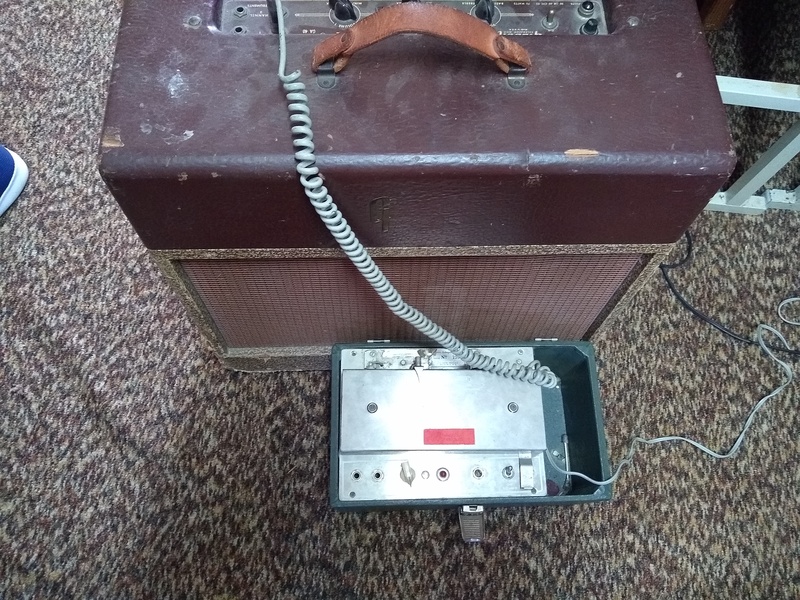 Above is the Echoplex hooked up to the Gibson amplifier, but not working because of a burnt out tube in the amp. 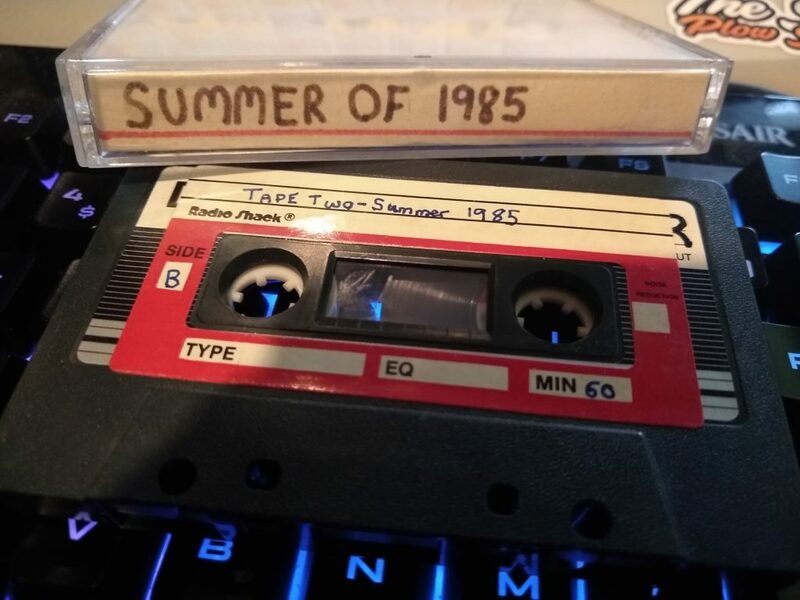 Below is the setup I was using to record the Summer of ’85 portion. Part Two is all about my neighbor Sara, who used to embark on all kinds of evil missions with me in the evenings. The missions included, but weren’t limited to, toilet papering trees, stealing porch light bulbs (or just loosening them to make them appear burnt out), peering in windows, setting things on fire, knocking and running, and avoiding police cars at all costs even if we hadn’t done anything wrong, which usually meant being chased by them because they thought we were up to no good. We’d rearrange people’s lawn furniture, we’d hang strings across the roads to confuse motorists, once on trash night we stole everybody’s trash and put it in one person’s back yard. In the trash area, not the yard. But it was about 5 blocks worth of trash in one single yard. I bet the trash men were a little confused about that one. We started a club at some point, called the BASLC. The Brad and Sara Lab Club. Because my garage was the lab. We had monthly dues, but I don’t think we ever actually spent the money on anything. In fact, I never got my share of the money back after we went our separate ways. I was ripped off! We were hoping to save up for a set of intercoms to put in our rooms so we could talk to each other. Our windows faced each other, but were on different floors. So we had to contact each other by shining flashlights, throwing rocks, or doing half-rings on the telephone which annoyed our parents. I don’t think our “club” ever actually did anything besides collect dues and write songs. She played guitar, and we recorded quite a few tapes of us singing and talking together. I think she ended up with most of those, because I only have one of them now. We wrote a few songs together, mostly weird parodies. I think I still have lyric sheets to them somewhere around here. I know we did a lot of hits of the time too, but the only one I can remember is Islands in the Stream. We were into the duets. I spent weeks during the days drawing a colored, detailed, scale (more or less) map of our block to help us on our missions. This map was on a small piece of posterboard and included every rock, tree stump, garden, car, clothesline, etc. in everyone’s yard. I suppose the map didn’t really help, it was more just to make it all more fun for us. I even bought those pin flags, to mark important things on the maps. My garage was command central, we carried walkie-talkies, we had code names, we had our own secret handwriting that we could read and write fluently. I still can, in fact. Anyway, we did these things for a couple of years. She finally grew up and became interested in a boyfriend so we stopped hanging out so much and I found new friends. We hung out a few times during jr. high and high school, but we’d outgrown our nightly missions by that point. 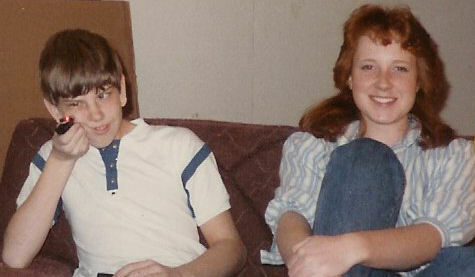 That’s a picture of us, in the attic, probably taken a year or two after 1985. Thanks, Mr. Biggs, for creating the guitar loop for me since I never got around to it. The ending song is The Moon Is High (And So Am I) by Roger Miller. 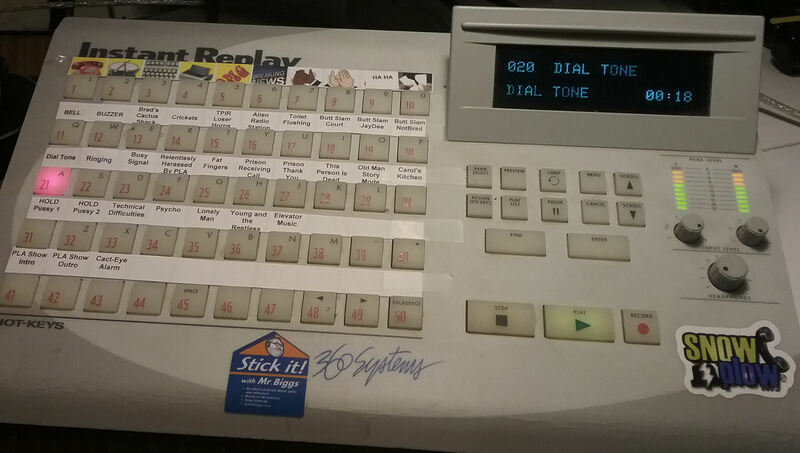 Earlier this month a very generous listener of The Snow Plow Show was nice enough to send me a sound board machine. It’s called an Instant Replay Hard Disk Audio 2.0 and it’s manufactured by 360 Systems. I’m told that radio stations across the country used these to play sound clips and promos during the 1990’s and early 2000’s before upgrading to something new. It’s an awesome machine and works great. The buttons have an instant response time which is a nice upgrade from the Android tablet and soundboard app I’ve been using for years. This thing will make doing live shows much easier for years to come. The only problem with my 360 was that the hard drive wasn’t sounding too good. It made a high pitched noise the entire time it was running, which could be heard while recording shows. It also clicked loudly at every single button press. It seemed likely that the hard drive could die at any second. After playing a few random sound clips I found on my hard drive last night, we jump into the mysterious world of 1986 where we jam out to the Neutron Dance, where I say everything I type into the computer for the listening audience just like I was taught in movies, where I torment the teenagers that hang out in front of 7-Eleven, where I get shot in the chest at point blank range, where Domino’s finally quits taking phone orders from non-human voices, and where everyone is so concerned about that damn box. Here’s an old post I made about writing TRS-80 program variables on the wall in my closet. FML means First Middle Last, 2008 Brad. Derrr. Here’s a 2007 post mentioning things I’ve found on old cassettes. Here’s another post about importing my old tapes. Here’s Pauldotcom’s Security Weekly Show on his fancy new domain. Here’s a website that obsesses over TRS-80 Color Computers. 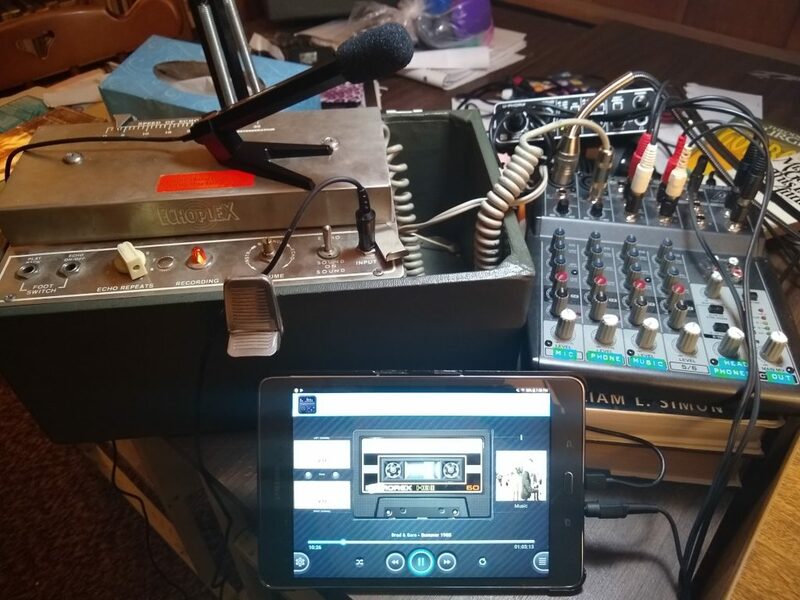 Their setup is much fancier than mine where I had it plugged into an old TV, but you get an idea of the hardware we were using. In this show we get to know residents of Celina, Ohio on a very personal level with some hard-hitting questions. Here’s one of those drive-thru convenience stores. I don’t know if that one’s in Celina, though. Here’s a Streetview of one in Celina I used to go to. This episode of Brad’s Cactus Shack activates my old man story mode so I can tell stories about old men. Then I play some old 90’s Dino audio that can barely be heard, but it’s okay because I tell you small parts of what he probably said, then drone on and on about OCI for a bit. We wrap it up with voicemails from an ex-employer of mine that I remembered being funnier back when I recorded them. The opening bit is from old Q106.5 broadcasts, background music is Walk Of Life by Dire Straights, and the ending music is I Am Very Happy Right Now by Bonecage. Cody NoName sent me a link to a conspiracy video that I really want to watch, but I’m too afraid to watch it by myself because conspiracy videos are scary, so I’m bringing you guys along to watch it with me. This is a conspiracy theory about the Skunkworks situation and what those underground tunnels really mean. Don’t worry, there’s nothing in the video that you actually need to see. It’s mostly video of text that Evvonne is reading with the very important parts highlighted in yellow highlight pen, because that’s an important thing to do with you’re talking about conspiracies. Here’s another article with a bit more information. This one claims that Skunkworks met the other guy as an adult, so I’m not sure where Evvonne saw that they were childhood friends. Maybe I was confused about what she said and it was actually a childhood friend of Askia Khafra who was talking about the incident. Here’s the June 22nd, 2010 episode of The Phone Show which was played near the end of this show. There’s a little more to it, but it seemed boring so I stopped playing it. Haha, JUST as I was about to hit the publish button for this episode, I got a call from Maryland! It was a lady from the dumpster company that I called last night, saying she noticed they missed a call from me. I explained that I saw her number in a conspiracy video and was just calling to see if it was a real number. She was probably actually a CIA agent just checking up on me. 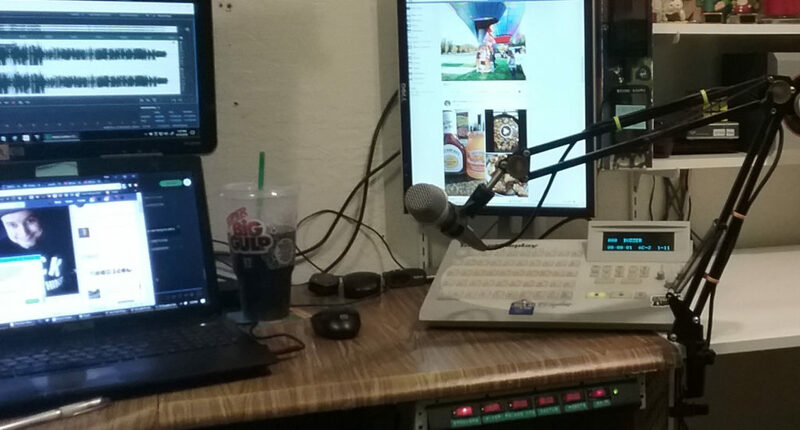 On Wednesday night I sat in my moderately comfortable chair and took calls from viewers for about an hour, who all seemed to think it’s funny to make prank calls to me. This is a serious show, people, and if the prank calls don’t stop I will end it. The song in this one is called Rocking Chair by Dean Friedman. It’s a song about sitting in your rocking chair and broadcasting while people call you. The background music during the live part is With You by I Fight Dragons.